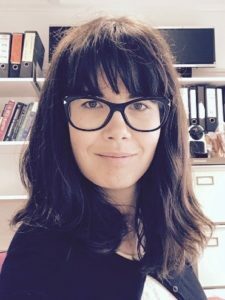 We are delighted to announce the appointment of Ana Rodriguez-Mateos as Associate Editor to the Food & Function Editorial Board. Ana started as an Associate Editor on the 1st November 2018. Dr. Ana Rodriguez-Mateos is an Assistant Professor in Nutrition at the Department of Nutritional Sciences, Faculty of Life Sciences and Medicine of King’s College London. She received her BSc degree in Chemistry at the University of A Coruña (Spain), and obtained her PhD and conducted her postdoctoral studies at the Department of Food and Nutritional Sciences of the University of Reading, UK. She then worked as a Research Group Leader at the Division of Cardiology and Vascular Medicine of the University of Dusseldorf in Germany, before joining King’s College in 2016. Her research aims to investigate the impact of plant food bioactives on cardiometabolic health, with a strong focus on understanding the bioavailability, metabolism and cardiovascular health benefits of polyphenols. 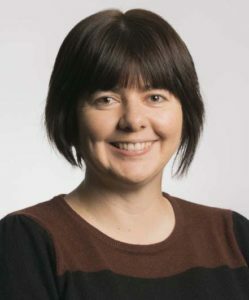 Her expertise includes development and validation of analytical methods for identification and quantification of phytochemicals in foods and biological samples and performance of randomized controlled trials with cardiovascular outcomes. She is a member of the Royal Society of Chemistry, Nutrition Society and the American Society for Nutrition. We welcome Dr. Rodriguez and her expertise to the Food & Function Editorial Board as an Associate Editor. Submit your articles you Dr. Rodriguez now! Not long now until Food Matters Live 2018!! It will be held at ExCeL London, from 20th – 22nd November, 2018. As the UK’s largest and fastest growing event showcasing the food and drink innovations shaping health and wellbeing, it is simply not to be missed. Food Matters Live brings together a cross sector community of engaged industry experts – the policy makers, the innovators, the fresh start ups, the established household names, in an unmissable three day event. Join 800 exhibitors, 400 speakers and 1000s of visitors at Food Matters Live 2018. If you are quite rightly interested in this event, then please click here for further details. 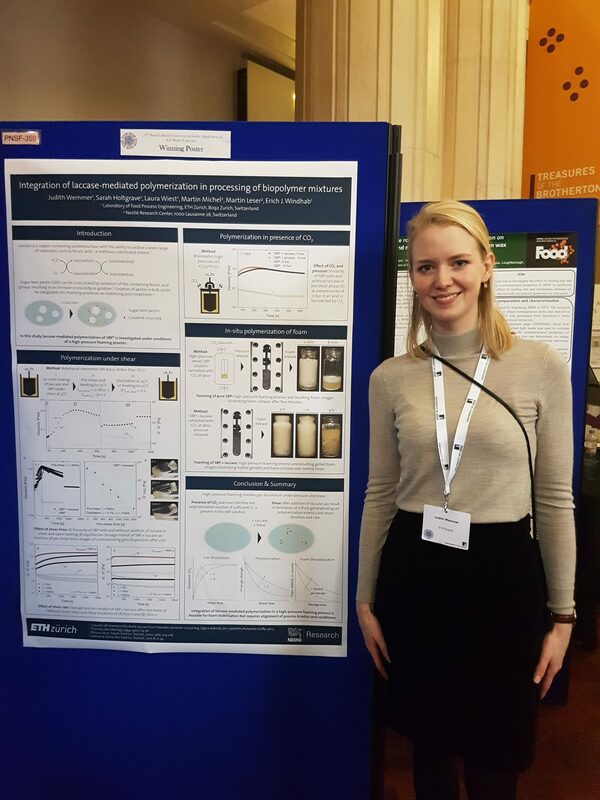 Food & Function sponsored two poster prizes at the recent Bioavailability meeting in Norwich. Congratulations to the winners: Essi Paivarinta and E Wood! Are you going to be at Bioavailability 2018 in Norwich? 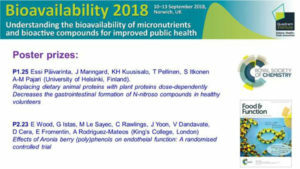 Will you be at Bioavailability 2018, September 10-13, Norwich, UK? Food & Function will be sponsoring two poster prizes, so best of luck! Rebecca Brodie, Deputy Editor, Food & Function, will be attending. I look forward to meeting you in Norwich! 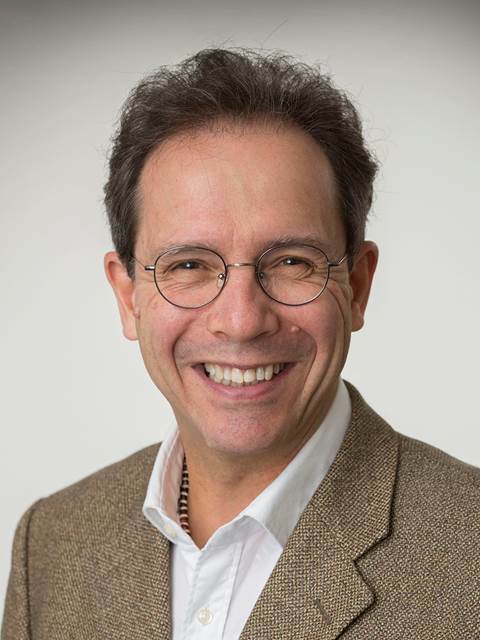 We are delighted to announce the appointment of Francisco Goycoolea as Associate Editor to the Food & Function Editorial Board. Francisco started as an Associate Editor on the 1st August 2018. Francisco Goycoolea is Professor (Chair in Biopolymers) at the School of Food Science and Technology, University of Leeds. He has a BSc (1988) in Chemistry-Biology-Pharmacy from Universidad La Salle, Mexico City; a MSc (1990) Food Science from University of Reading, U.K., and a PhD (1994) in Food Polysaccharides from Cranfield University, U.K. In 1995, he was founder, and during eleven years led the group of Biopolymers at CIAD (Hermosillo, Mexico). In 2006, he joined the Faculty of Pharmacy of University of Santiago de Compostela (Spain) as a visiting scholar. Between 2011 and 2016, he led a research group in Nanobiotechnology at the Department of Biology of University of Münster (Germany). In 2016, he was appointed full professor (Chair in Biopolymers) at University of Leeds (UK) where he is leader of the Food Chemistry and Biochemistry Group. He was elected founder President (2002-2006) of the Iberoamerican Chitin Society (SIAQ), and is member of the Board of the European Chitin Society, EUCHIS (2011 to date). He is a member of American Chemical Society (ACS), Royal Society of Chemistry (RSC), The Nutrition Society (NS), and Society for Applied Microbiology (SfAM). He belongs to the National System of Researchers of Mexico (SNI, Level III). We welcome Professor Goycoolea and his expertise to the Food & Function Editorial Board as an Associate Editor. Submit your articles to Professor Goycoolea now! 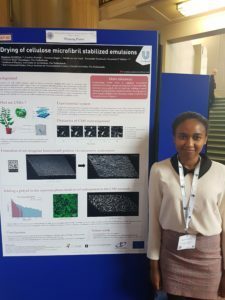 The School of Food Science & Nutrition, University of Leeds hosted the successful 17th Food Colloids Conference: Application of Soft Matter Concepts, which took place between 8th – 11th April 2018. 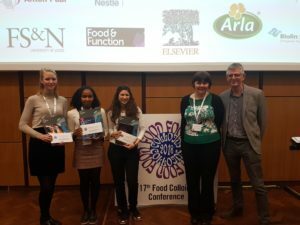 The conference welcomed 300 delegates from 29 nations who attended the conference to learn, network and engage with the Food Colloids research that was presented. The event was not only special as it marked the return of the conference to the UK after 14 years but also because of the record-breaking number of attendees, number of countries represented and high quality posters in the conferences’ history. The conference boasted 182 posters that were on display in the iconic Parkinson building throughout the event to maximize exposure to the cutting edge research. 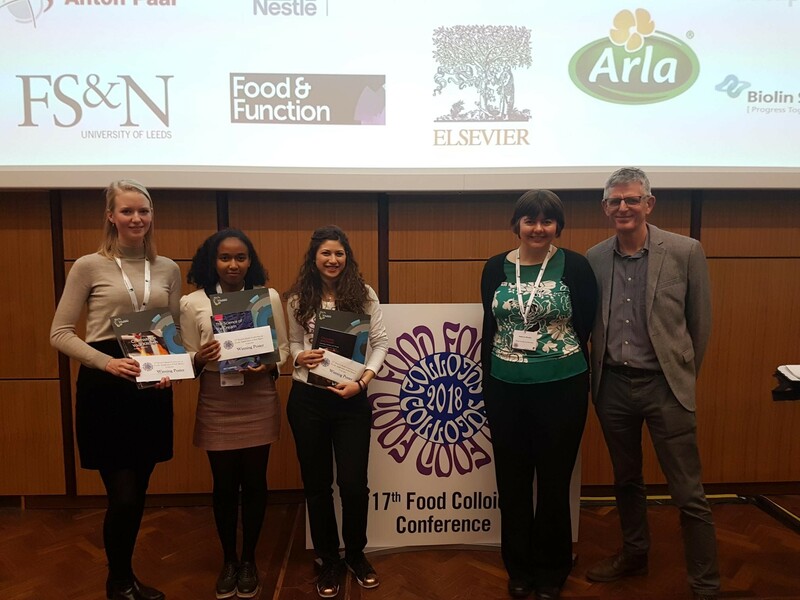 All students were entered into the Poster Prize which was sponsored by Food & Function. 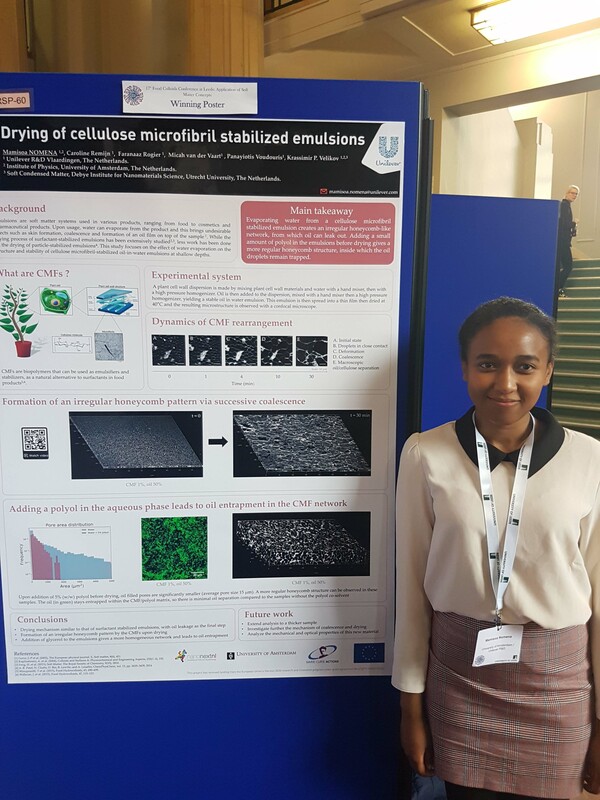 The three winners of the competition were: Morfo Zembyla (University of Leeds) Stabilization of water-in-oil emulsions using food grade materials, Judith Wemmer (ETH Zurich) Integration of laccase-mediated polymerization in processing of biopolymer mixtures and Mamisoa Nomena (University of Amsterdam) Drying of cellulose microfibril stabilized emulsions. The University of Leeds is home to the biggest and most highly cited Food Colloids and Processing academic group in Europe. The Food Colloids Group at the University of Leeds is internationally acclaimed for its interdisciplinary research worldwide, ranked first in Europe and third in the World according to field-weighted citation impact in Food Colloids, making it an ideal location for the conference destination, alongside it originating in Leeds. Anwesha Sarkar, Associate Professor of Food Colloids at the School of Food Science & Nutrition at the University of Leeds, who is the conference chair commented: “We are delighted with the incredible success of our recent conference held in Leeds, and felt it truly highlighted the excellent conferencing facilities the city has to offer. The event offered an ideal environment for inspiring scientific conversation, with new knowledge uncovered as Food Colloids research reaches an important crossroad with paradigm shift towards ‘tailored’ food design for improving nutrition and human health. Food Colloids is a biennial conference in the field of physical chemistry of complex foods. The subject area of the conference is physical chemistry of complex food systems with special emphasis on macromolecules that structure food. The aim is to expand knowledge on how interactions between food components create multi-phase structures on different length scales. Food & Function had the pleasure of sponsoring Food Matters 2017 and we are back again for another year! It will be held at ExCeL London, from 20th – 22nd November, 2018. Will you be at Food Colloids 2018 in Leeds? 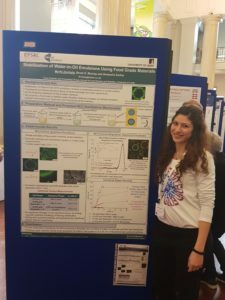 Will you be at Food Colloids 2018, April 9-11, in Leeds, UK? Food Colloids is a biennial conference in the field of physical chemistry of complex foods. The main theme of this conference is ‘Application of Soft Matter Concepts’ and the scientific sessions will cover a series of topics illustrating the interplay between fundamental colloid science research and more applied soft matter research. Food & Function will be sponsoring the three student poster prizes, so best of luck! I look forward to meeting you in Leeds! 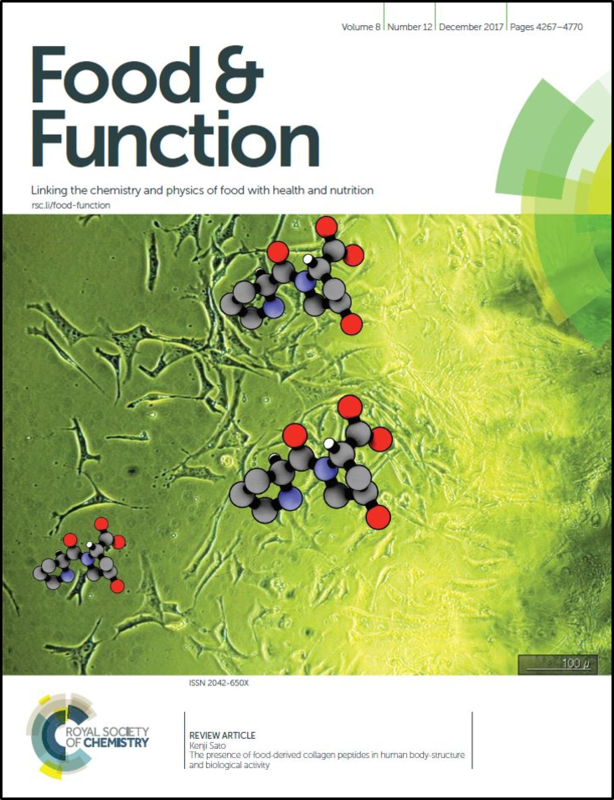 We would like to highlight the Outstanding Reviewers for Food & Function in 2017, as selected by the editorial team, for their significant contribution to the journal. The reviewers have been chosen based on the number, timeliness and quality of the reports completed over the last 12 months. 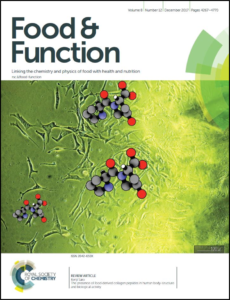 Dr. Huaqi Zhang, Netease Inc.
We would also like to thank the Food & Function board and the food science community for their continued support of the journal, as authors, reviewers and readers.